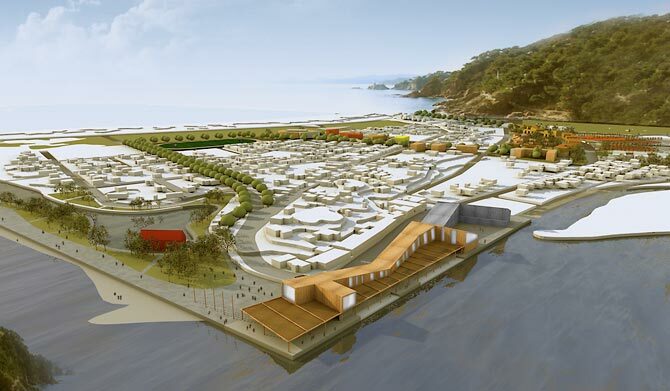 Experts are working on a masterplan to rebuild the coastal city of Mehuin, which was devastated by the post-quake tsunami that struck in 2010. Image courtesty of Biskupovic Arquitectos, Chile. Berkeley — María-Paz Gutierrez, a University of California, Berkeley, assistant professor of architecture, has been named to the 2011-2012 Fulbright Regional Network for Applied Research (NEXUS) Scholar Program as part of a 20-member team working to promote best practices in fighting poverty and inequality in the Western Hemisphere. Gutierrez will work in her native Chile on a sustainable and affordable housing prototype that also could be deployed in an emergency, particularly a flood. One of five scholars from the United States chosen for this year’s NEXUS team, which is organized through the U.S. State Department’s Bureau of Educational and Cultural Affairs, Gutierrez is part of a group that will spend the coming year conducting sustainable energy research. The two other NEXUS teams will focus on entrepreneurship, and science, technology and innovation. All teams will convene at various points for lengthy workshops in Buenos Aires, Mexico City and Washington, D.C.
Gutierrez will begin constructing her prefabricated prototype home in December in the coastal fishing community of Mehuin in southern Chile, which was devastated once by a tsunami that followed a major earthquake in 1960, and again in 2010. The prototype design and development will be begin this summer and fall at UC Berkeley. Gutierrez said her primary goal, is to lay the integrated architectural, socio-economic, engineering and other scientific foundations for affordable housing designs. Her approach to those designs is based on using nano-scale photovoltaics and a micro photonic solar panel to enable solar-based energy storage and greywater disinfection, recycling and reuse for heating, cooling and efficient water management. 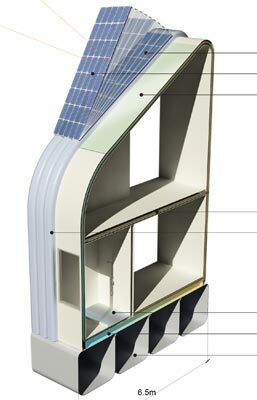 The building prototype design calls for a pneumatic structure on the roof for adjusting the nano-solar photovoltaic panel, a greywater recycling system and water tank, and a hydronic floor heating system, among other features. Advancing flood-resistant housing is especially important, she said, in an area like Mehuin, which is at high risk for flooding, is plagued by water contamination, and generates constantly high energy demands with its chilly winters. Plus, Chile’s recently introduced financial subsidies for energy and water conservation in affordable housing presents a valuable opportunity to radically boost sustainable building technologies there, Gutierrez said. But there are many areas in Chile and throughout the Western Hemisphere that face similar pressures on their water and energy resources and trends of increasingly high residential energy use. Gutierrez noted that because of their large populations, developing nations today consume twice as much energy as developed countries, and 94 percent of the inhabitants of developing countries live in slums that are concentrated along vulnerable coastlines. In Argentina, she said, energy use has grown by more than 30 percent since 1990 and has almost doubled since 1980. Meanwhile, a European Commission report in 2008 estimated that a water shortage in the Andes mountain range will affect 37 million people by 2018 and 50 million people by 2050. “I’m interested in real, tangible innovation in sustainable architecture, which every day becomes more important in Latin America and around the world,” said Gutierrez in explaining the drive behind her research. Working with her on the project in Chile will be UC Berkeley graduate research assistants Kylie Han and John Faichney as well as faculty collaborators, local stakeholders such as the local paper company Arauco de Valdivia-CELCO and Mehuin’s Fishermen’s Federation, Universidad Austral de Chile in Valdivia students and faculty, and designers of a new Mehuin masterplan, Biskupovic Arquitectos. The firm is led by Jose Miguel Biskupovic. 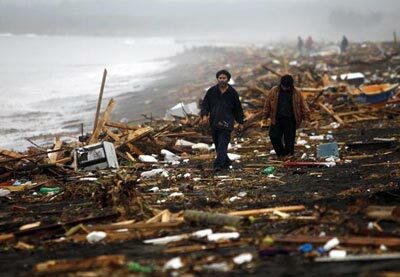 Residents in coastal communities can find themselves homeless after devastating natural disasters. Gutierrez plans on integrating her Fulbright NEXUS work with ongoing research in smart membranes and solar-based greywater disinfection that is funded by the National Science Foundation and is being developed in collaboration with Luke Lee, a UC Berkeley professor of bioengineering, and Slawomir Hermanowicz, a professor of environmental engineering at UC Berkeley. Gutierrez will present the results of her work in Valdivia, Chile, at a UC Berkeley symposium of leading scholars in next-generation, sustainable architecture from throughout the Western Hemisphere, the Universidad de Austral and UC Berkeley. It is set for spring 2012. She and Lee will co-chair the workshop. Three years ago, Gutierrez founded BIOMS, an interdisciplinary research initiative blending the principles of architectural design, engineering and biological sciences to develop new material systems. Gutierrez is the first architect to be designated the principal investigator as part of a National Science Foundation EFRI-SEED Award 2010 for research innovation in sustainable building technologies that are based on micro-engineering principles. Earlier this month, Gutierrez was chosen one of 15 finalists in the eVolo architecture and design journal’s 2011 Skyscraper Competition for her proposed “Detox Tower” solution to urban air pollution in high-rise construction in an era of climate change and diminishing resources. She plans to further develop this speculative design through a research proposal next year, with collaborators from engineering and biosciences. Gutierrez also has just been selected to receive the 2011 Sarlo Distinguished Graduate Student Mentoring Award for Junior Faculty. In the announcement of the honor, she was commended as “inspirational, motivational and pioneering” and for reaching across disciplines to build collaborations that benefit students in her own department and others. Gutierrez has built projects in the United States, Chile and Brazil. She also has exhibited and published her architectural designs nationally and internationally.